Go, Voltron: Defender of the Universe Trailer! Five-player co-op? Of course the forthcoming video game based on Voltron: will have five-player co-op, with each player controlling the mechanical lion of their choice, each player working together to wield Voltron's Blazing Sword to dispatch some big bad guy in 30 seconds or less. 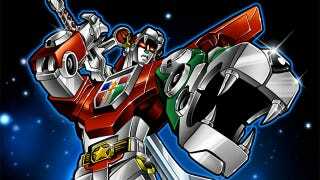 Voltron: Defender of the Universe is THQ's first video game based on the iconic '80s anime series. It's coming to Xbox Live Arcade and PlayStation Network this October (for ten bucks) and will be featured at this week's San Diego Comic-Con. IGN has new details and a trailer on the game that offers five-player co-op online, two-player co-op offline and something for single-player only types to do. Let&apos;s Go To Comic-Con, Voltron Force! Developed by Behaviour Interactive, they of Naughty Bear, Wet and Ghostbusters: Sanctum of Slime fame, Voltron: Defender of the Universe, expect some of the better known battles from the Voltron cartoon to appear. Here's your first trailer for Voltron: Defender of the Universe.